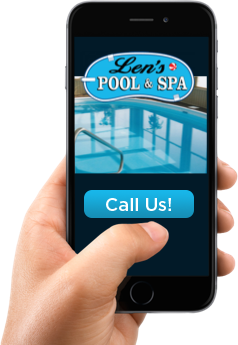 For over 40 years, Len at Len’s Pool and Spa, Inc., has provided the Blue Water Area in-ground and above-ground pools and spas, with professional service that has stood the test of time! Our showroom is located just north of the light in Lakeport, Michigan. We are a trusted, local business that strives to make your experience with us as pleasurable and satisfactory as possible. Len’s Pool and Spa, Inc. is proud of our knowledgeable and trained staff, and we strive to educate our customers with the newest products and designs for their pool or spa. We work one-on-one with you to help transform any project into your own personal paradise! Contact us today to speak with one of our friendly staff members to set up an appointment, answer questions, or to have information on any of our products sent to you. We offer free, in- home estimates, whether it be in ground pools, above ground pools, spas, or repair and maintenance. We are accredited by the Better Business Bureau and will gladly provide references upon request. Professionally Licensed and Insured! In-ground, or Above-ground pools available in all sizes, shapes, and colors customized to your family’s needs! We proudly carry Dimension One Spas. Whether it is for simple relaxation, aquatic fitness, swim spas, or therapeutic and tactical needs, we have the perfect spa for you! Low-interest financing options with your choice of two companies, Light Stream and Key Bank.